In the computing world, 2007 was a long, long time ago. Over the previous decade laptops had taken a stronghold and had severely weakened the traditional desktop PC market. Consumers wanted portability, however even with the newest designs at the time, the weight, size, and baggage (literally) of carrying around a traditional laptop were still too much for people to enjoy. That’s why in 2007 we saw the introduction of both the “netbook”, a miniature, lightweight, underpowered laptop that could be thrown in a purse, and the iPhone. Both portable platforms were immediate successes. 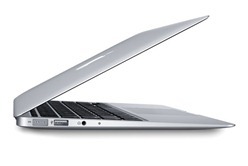 Seven months after introducing the iPhone, Apple followed with the thinnest laptop the world had seen. The lightweight MacBook Air was decidedly more portable than popular laptops at the time, and certainly more powerful than the handcuffed Windows and Linux netbooks that were catching on. The Air saw modest success, however the big story in the last five years has been the iPhone. As applications and power came to the device, people came..in droves…to a device that quickly saw computing, not telephony, as the iPhone’s primary role. Two years after the introduction of the iPhone, Apple released the iPad, a slate computer that was about 4X the size of the iPhone. Initial sales of the device were good, but certainly didn’t have netbook fans worried about the future of that platform. In fact that year stalwart Microsoft supporter Paul Thurrott patronizingly proclaimed that the iPad was no match for netbook sales. Netbooks were forecasted to sell 46 million units in 2010, and grow to 60 million by next year (2013). In fact the opposite happened. Apple sold 40 million iPads in 2011 while netbook manufactures like Dell quit the netbook market altogether. The iPad not only “killed the netbook”, it sent Microsoft scrambling to totally redesign history’s most popular operating system. When Windows 8 is released later this year it will be clear to everyone that tablet computers are well on their way to taking over. The consumer PC world certainly has changed in the four years the MacBook Air has been on shelves. What hasn’t really changed is the MacBook Air. While there have been modest improvements, the low end of Apple’s traditional computer offering now stands as a relic: an underpowered and overpriced traditional laptop that, while light and reasonably mobile, is hampered by problems solved by its younger sibling, the iPad. One of Steve Jobs’ last mantras repeated in public was the concept of a “Post-PC World”. The development of the iPad can eventually offer all of our computer needs on a tablet. While cloud storage services such as iCloud, Dropbox, SkyDrive, etc, gained popularity, Apple removed the disk drive and DVD drives from the MacBook Air, leaving the question of just why this device is even needed in Apple’s catalog in an iPad world. Instead of a 13” MacBook Air, a better solution for Apple would be a 13” iPad. By widening the device by the width of the right bezel (0.75”) and extending the device’s length by a little more than 2”, Apple could have a device that, when paired with a Bluetooth keyboard, could serve all of the functions a MacBook Air currently does. The new 16:10 form factor would borrow the screen proportions from the 13” MacBook Air and would match the rumored screen coming to the new iPhone. If the iPhone is going long, then perhaps the entire iOS platform, including the iPad should, too. Microsoft’s clever answer to the iPad will spawn a new market of tablet PCs. The Intel-based tablets will not only run Windows 8’s iOS-like Metro “layer” and its apps, but also will run the classic Windows Desktop and legacy applications. With these capabilities it is likely that a revolution will ensue on the Windows side. Windows 8 users will be able to use Metro apps on the go, but when they want to get serious work done, they can dock their tablet to a large external monitor, keyboard, and mouse to offer a full desktop experience. In all likelihood in just 3 years the traditional laptop will disappear from store shelves as flexible portable devices with great battery lives take over. This is a scenario to which Apple will absolutely have to respond. Their best bet is to consider how the iPad can be used productively in a desktop setting. The current size is too small for such work, so the offering of a video out method (via HDMI or an Apple TV-like wireless device connected to the desktop monitor) is essential to Apple for extending the growth of the iOS platform. However a large iPad, such as the previously-proposed 13” model, might by itself offer enough screen real estate to get considerable work done, just as the 13” MacBook Air offers. When we first met the MacBook Air, it was the beginning of a mobile computing revolution that still isn’t over. The trajectory of the revolution is becoming clear, though, and where we are headed is a world where thin, touch-centric tablets will be the centerpiece of most people’s work flow. Some will still desire the full capabilities of a traditional laptop, and for those people Apple is continuing to push the MacBook Pro. However did you see what is happening to that machine? The DVD drive is disappearing and the device is getting much thinner and lighter. It’s almost as if Apple knows it has no choice but to deflate the Air.